Bible Contradiction? Did both thieves revile Jesus? Good Friday and Resurrection Sunday is coming soon. Stay tune next week as Lord willing we tackle more of these alleged Bible contradictions. For other posts dealing with Bible contradictions see our Collection of Posts Responding to Bible Contradictions. 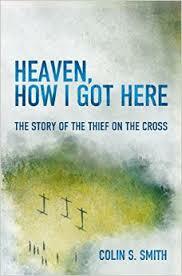 Smith, Colin S. Heaven, How I Got Here: The Story of the Thief on the Cross. Fearn, Ross-shire: Christian Focus, 2015. This book which is 95 pages is packed with ancient Gospel truth, but done in a fresh imaginative and dramatic writing style that does not compromise the veracity and integrity of the Gospel. The author skillfully brings together sound doctrine, powerful theological accounts of the cross, and historical accuracy concerning the drama of this account concerning the thief and Jesus Christ. Here imagination is used properly for the glory of God. The book covers different scenes that are categorized this way: breakfast, hatred, faith, hope, love, darkness, agony, triumph, and safety. The main protagonist is the thief at the cross. His thoughts, feelings, and volition gushes forth from this book. The account of the thief’s thoughts although imaginative, except for his few words as recorded in Scripture, are sound words that echo Gospel centered truths of how a sinner maybe saved. I have never witnessed a book that has approach the thief’s account in this manner. Besides the profound imaginative features, what I found refreshing are some of the precise and deep-seated truths of the Gospel that emphasize the grace of God, the holiness of God, the justice of God, the sinfulness of man, and the intense reminder that the gates of Hell and Heaven are only inches away from us. I don’t want to give out too much details about this book. I recommend buying it and reading it. It is a great book for an unbeliever who needs the Gospel and for believers who need a profound and refresh way of explaining the Gospel to sinners who are in danger of judgment and in desperate need of forgiveness. Thief at the cross, “I endured the pains of crucifixion, but I did not experience the agonies of hell. Jesus endured them for me, so that I would never know what they are like. The more I think about this, the more staggering it gets” (71). NOTE: I received this book for free from the publisher Christian Focus Publications through Cross Focused Reviews in exchange for my honest opinion. The thoughts and words are my own and I was under no obligation to provide a favorable review.